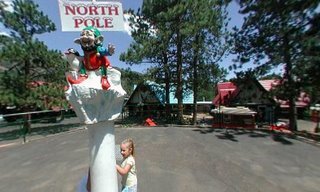 I almost forgot about one of my favorite Colorado Springs attractions: The North Pole! This is a one-of-a-kind amusement park nestled just up into the foothills. The theme is Santa's Workshop and all of the rides have been painted in the winter theme. There is even a pole that is filled with liquid nitrogen or something tha makes water condensation freeze to it and create a "North Pole" that people can touch and carve markes into. There is a smaller train that goes all around the park for the youngsters and even a ski gondola to give an ariel view. Every time my family went I spent tons of time on the "flying ride" for lack of a better name. This ride was made up like one of those spinning swing rides except instead of a swing there are little carts that have a large fin fixed to the front and the back. The rear fin is fixed and functions much like the tail of an airplane; keeping things stable. The front fin is on a vertical hinge that allows the rider to control air flow around the cart as the ride spins. My Dad and I would ride this ride and really push the limits for how big of swoops and swings we could achieve. Great stuff! I hadn't really seen a ride like it until recently at Six Flags Elitch Gardens in Denver. There is a Batman ride that functions much in the same way but isn't nearly as thrilling because you can't get the cart swinging as out of control. Half the fun of the ride at the North Pole is that the cart would actually start jerking and bouncing when you swooped high enough. You would go really slow on a downswing and then yank way above the cliffside (where the ride was perched) and feel like the tiny cables connecting you could snap at any moment! Well, it's another one of my fondest childhood memories. The Flying W Ranch... 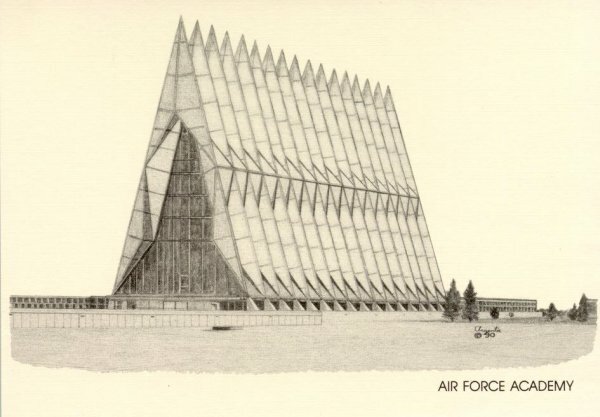 I think my parents learned about this place when my dad was working for Hewlett Packard in Colorado Springs. I think they used to have company off-sites there and the whole family would be invited for the supper that is served along with the band and the train rides and all of the other fun neat little things that are offered! These guys have teepees set up, old style western shops, a country style band, and honey butter that is so good. This is really a neat place to take the family and I had a blast running up and down the steps to ride the train and explore the rocks there when I was a kid. 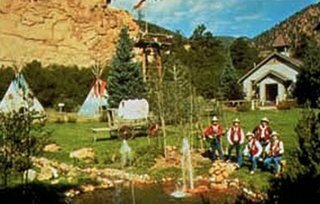 The Flying W Ranch is located just up on the foothills of Colorado Springs and sort of rests between some of the same sort of rock formations that make up the Garden of the Gods. I think every Colorado local has heard of Cave of the Winds. This cave was discovered by a couple of teenagers many years ago when howling sounds were heard. These days the cave has been nearly completely explored and the larger sections feature stairways with railing and flourescent colored lights to add a bit of artistic flair. Cave of the Winds also touts a high tech laser lights show that is projected onto a large flat canyon wall (made of rock). 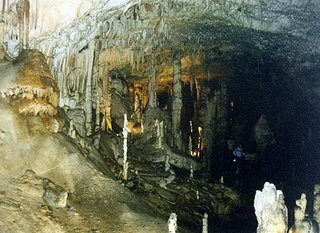 Perhaps the coolest part of the Cave of the Winds is the deep exploration tour. This special guided tour is set up for more adventurous souls who want to experience the thrill of old time true explorers. On many parts of the tour you actually have to squeeze yourself through long tight tunnels and there is no way to turn around! You get all decked out in gear and have a helmet and light... It's not for the faint of heart or clastrophobic! Expect to get dirty on this tour but definitely have a lifelong story to tell after you make it out. Even thought I was born in Colorado Springs, I didn't spend much time there until I was a bit older. My family would take short road trips from Loveland (which is about 1.5 hrs North) and we would hike and explore the area. I love mountain biking at Garden of the Gods! There are some sweet trails that take you all around the park... I used to have a great Scott brand bike but outgrew it and ended up with my Dad's carbon fiber Diamondback. These days I ride a Marin (which is funny because I lived in Marin California when I bought it used). 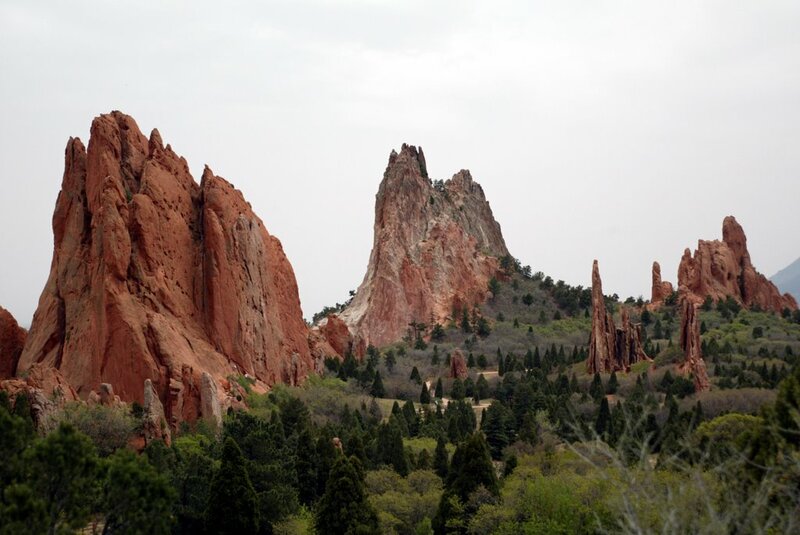 Okay, so besides mountain biking there is really a lot to do at Garden of the Gods. One of my favorite parts is watching rock climbers! The whole park is full of rock formations that jutt out of the ground and provide world class climbing routs. If you ever get the chance to go, head towards the main formations (the largest ones near the visitors center) and walk in between the rocks on the trail, you will see free climbers and skilled lead climbers making assisted asents all the way to the top. People also jog around these parts and there is a lot of horseback riding. Born in Colorado Springs on October 13th 1983. My father worked for Hewlett Packard at the time and we only lived there for a short time.